Here's the text in the poster, with an added note from the blogger I found this through. 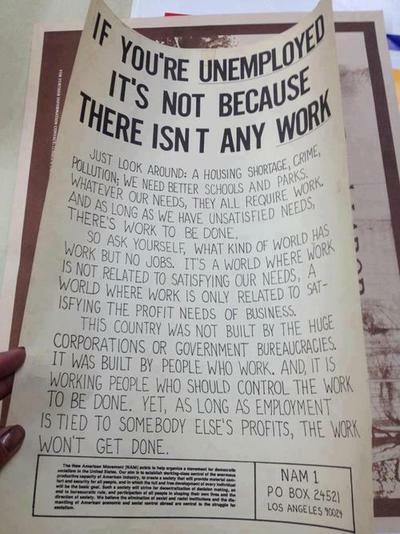 If you’re unemployed, it’s not because there isn’t any work. So ask yourself, what kind of world has work but no jobs? It’s a world where work is not related to satisfying our needs, a world where work is only related to satisfying the profit needs of business. Also, the government is one of the few organizations that pays people to help with schools, roads, emergency services, etc. so “cutting government funding” doesn’t help, it hurts. What kind of work is related to satisfying the needs of people in our society? For example, what are some present social needs, what are some current pressing problems that need to be solved? What kinds of problems do you think we need to develop technology to solve? What kinds of problems are technology companies providing us solutions for currently? What kind of work is most profitable? Which jobs are most desirable, or have the most social cachet? What kind of labor do you personally feel is is underpaid? What kind of labor do you personally feel is overpaid? What sorts of work are incredibly important but not paid for at all? What is the relationship between these two following statements? Housewives are not paid. Men are paid higher salaries, because the assumption is that they are 'breadwinners'. How does this play out in our economy?